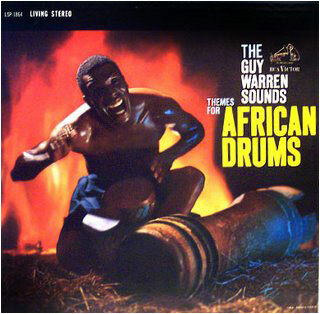 LISTENING NOTES: Primitive Passion: Guy Warren's "Themes for African Drums"
Primitive Passion: Guy Warren's "Themes for African Drums"
Featuring of the most compelling exotica covers ever, this hard to find recording from 1958 is actually one of the best drum records RCA ever made. Kofi Ghanaba (born Guy Warren in 1923) is a West African musician who, at the time held court at The African Room on New York's Third Avenue. Melding traditional African themes with a jazz sensibility, Guy Warren is the originator of "Afro-Jazz". He also spent time in Chicago, and worked with jazz legends Charlie Parker and Theolonius Monk. What Warren has created here is an exotic percussion album that features ancient instruments such as "The Talking Drum", conga drums, bongos, flute. The music is primarily rhythm driven, and some cuts feature vocals, shouting, and chanting. The hypnotic rhythm and dynamics of this special record are evident just by looking at the grooves. Each track is appears like a swirling spirograph of sound. This Living Stereo session was recorded in New York's Webster Hall on May 22, 1958 -- it just passed it's 48th anniversary. The sound is excellent by any standard, For reference, my pressing is a black dog label pressing with Living Stereo in silver print. It's from RCA's Indianapolis plant, and has 4S/1S stampers.